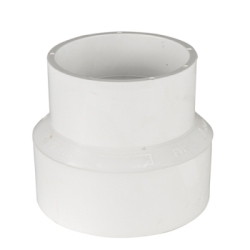 4" Sewer x 4" Sch 40 Adapter | U.S. Plastic Corp. These reducer coupling pvc drain fittings have a crush strength of 3000 lbs. The smooth internal surface prevents harmful flow resistance. No special tools or skills needed to install. To connect, just brush cement on the OD of the pipe and into the ID of the fitting. Then quickly insert the pipe into the fitting and rotate one-quarter turn for a permanent bond.